Ooliths on the surface of a limestone. An is oolith is a more or less spherical particle of sedimentary rock, up to 2 millimeters (0.1 inch) in diameter, which has developed by the accretion of material about an initial nucleus. Oolithic grains, usually consist of calcium carbonate, dolomite (magnesium calcium carbonate) or chamosite (an iron silicate mineral) and have a radiating, fibrous structure, or one consisting of concentric layers. The center of an oolith may be a grain of shell or quartz, which suggests to geologists that they grow in oceans or streams by accreting layers of calcium carbonate as they roll about in the turbulent water. 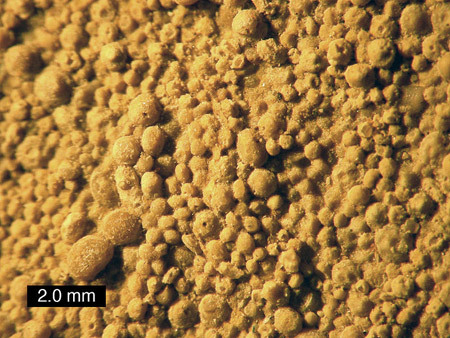 Ooliths give the rounded grainy structure to oolitic limestone. Larger ooliths are termed pisoliths. Concentration of ooliths can form, for example, oolitic limestones, often called oolites.